Johnny Carson had Ed McMahon. David Letterman has Paul Shaffer. Conan O’Brien has Andy Richter. Jon Stewart has Barack Obama. On Thursday night, the President of the United States returned to The Daily Show to face off converse politely with host Jon Stewart. It’s no secret that Stewart is an Obama supporter and is vying for the pres’ reelection this November. As such, Thursday’s show was more of a venue to highlight Obama’s strengths and offer him a platform to sell his policies in a positive, welcome light than it was an open, biting discourse. Stewart can’t be faulted for affording Democratic candidates fluff alone — historically, the longtime comedy talk show host has engaged in earnest discussions with and aimed to point out the flaws and fallacies in the behavior of individuals on both sides of the political spectrum. But as this is election season, Stewart wants to make his candidate look good. And there’s not too much wrong with that; if you had your own show, and you had a presidential hopeful who you truly believe in as your guest, you’d probably want to make him or her look good, too. 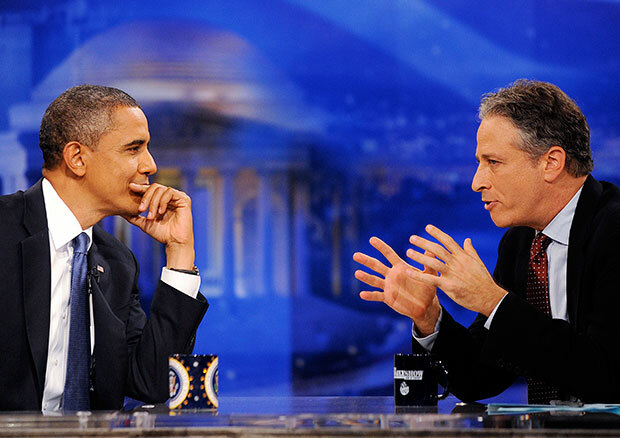 One thing that did come to light from the episode was Obama’s capability for keeping up with Stewart’s wit. For every good-natured jab Obama took at the president or Joe Biden Obama had a quick quip right back, nary missing a beat. As such, if he does find himself moving out of the White House this January, at least he can make his way in the comedy game. Obama and Stewart in a buddy cop flick — gold. Gold. Check out the extended interview below.